The inflammatory website of a violent terrorist group responsible for killing hundreds of US and coalition soldiers in Iraq is currently being hosted by one of America's biggest web companies, nine.com.au can exclusively reveal. Kataib Hezbollah (KH), an Iranian-sponsored militia which targeted America soldiers and its allies, including the Australian Defence Force, during the insurgency in Iraq, was designated a Foreign Terrorist Group in 2009 by the US government. Counter Extremism Project (CEP), a Washington DC-based think tank which monitors terrorist and extremist groups, told nine.com.au that since 2016 it has repeatedly urged GoDaddy to shut down KH's online presence, without success. 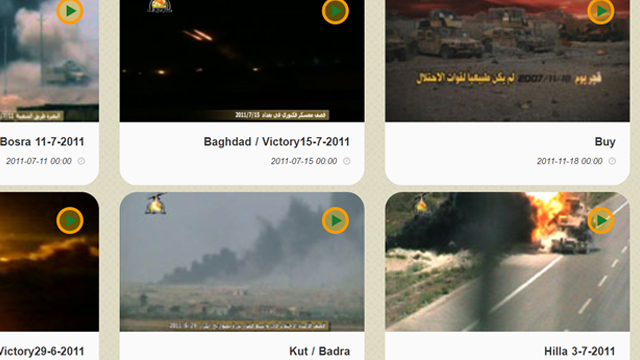 The KH website, which boasts it will "cut off the hand of America", has a trove of hundreds of videos on a "jihadi operations" page, purportedly showing mortar and rocket attacks on US bases, massive IED explosions in Iraqi cities and towns and other combat footage. In June 2011, five US soldiers were killed in Baghdad when KH militia fired multiple rockets into the Camp Victory military base. A video on the KH website matches the date of the Camp Victory attack. Despite flagging concerns to the Nasdaq-listed GoDaddy seven times since October 2016, the internet giant has allowed the KH website to carry on propagandising and threatening the US and its allies, CEP has claimed. "There is a very clear case to shut Kataib Hezbollah down," Daniel Roth, a CEP researcher who unearthed the group's commercial link with GoDaddy,said. When approached by nine.com.au, GoDaddy spokesperson Dan Race acknowledged the KH website breached the company's terms of service, which prohibits customers using its online services to promote or encourage terrorism. But Mr Roth said he was sceptical of GoDaddy's "boilerplate-type" response, blasting it as "pathetic and unsatisfactory".